Harriman has most definitely taken a hit this week. As Island Park reservoir is getting drawn down, turbidity has found its way into the river making fishing more of a challenge than it already is. I have been having a hard time finding larger fish rising. If you want to do some walking I have found a few larger fish rising in the middle of the ranch, walking in from the mailbox, but it’s been tough. The hatches have been consistent, I have spotted PMDs both in the mornings and evenings and have fooled a few fish with a #16 Limestone Cripple. The #16 Hi-Vis Rusty Spinner has worked well in the evenings also. Aside from the PMDs, we have also seen quite a few flavs. Plan on working a little harder with the off color water. You should still be able to find risers but they may not be real consistent. Warm River to Ashton, what can I say about this stretch. It is a fish factory! The thing about this stretch of river is that you are always going to find White fish and plenty of smaller trout in the 12 to 14 inch range but it always almost daily produces a hog! 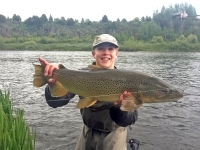 Last week two Rainbows in the 20 inch range were landed on two separate guide trips! When the water gets off color remember to break out the streamer box! Sparkle Minnows are hard to beat! I also like #4 Crystal Zonkers. If you want to do a little nymphing I would suggest #16 Tungsten Torpedo’s, #18 Red or Silver Lighting Bugs and of course the San Juan Worm. Dry flies will be most successful in the mornings and again in the evening hours. I would have #16 Lawson’s EZ Caddis in both tan and olive for mornings and at dusk and I would also have some PMDs for mid-morning. A #16 No hackle and #16 Quigleys Hackle Stacker will work well. Irrigation demand has decreased over the last little bit so there is more water form Vernon bridge on down. Fly patterns won’t change from what I mentioned above. I would add hoppers to the mix down there. A #14 Rainey’s Hopper should get some attention! 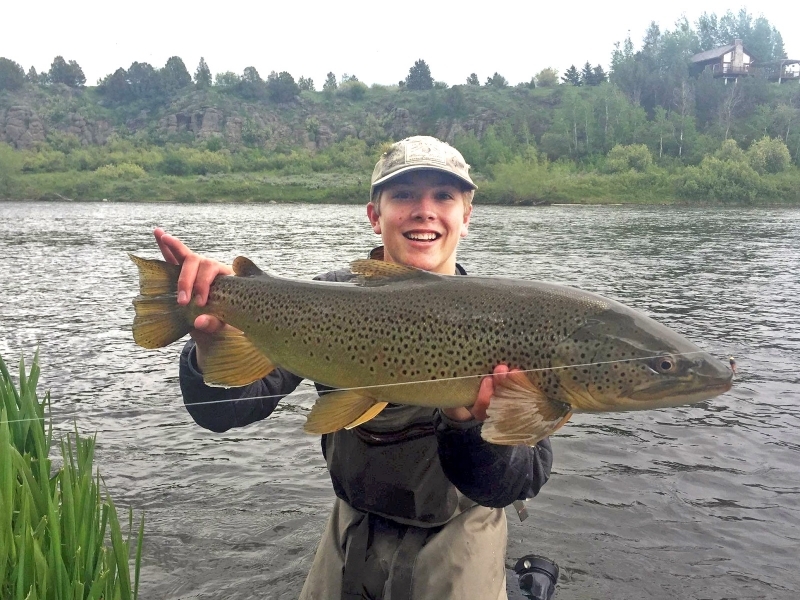 The South Fork continues to fish well. The big bugs are over for another season but we should start seeing the nocturnal goldens soon. Also the riffles continue to fish well during the day and there have been excellent Caddis hatches into the late evenings. I would have #16 Pink No Hackles #16 Lawson’sEZ Caddis. One of my favorite fly’s on the South Fork are #14 Partridge and Orange soft hackles. I love swinging them in the riffles and the Cutties also love to eat them. 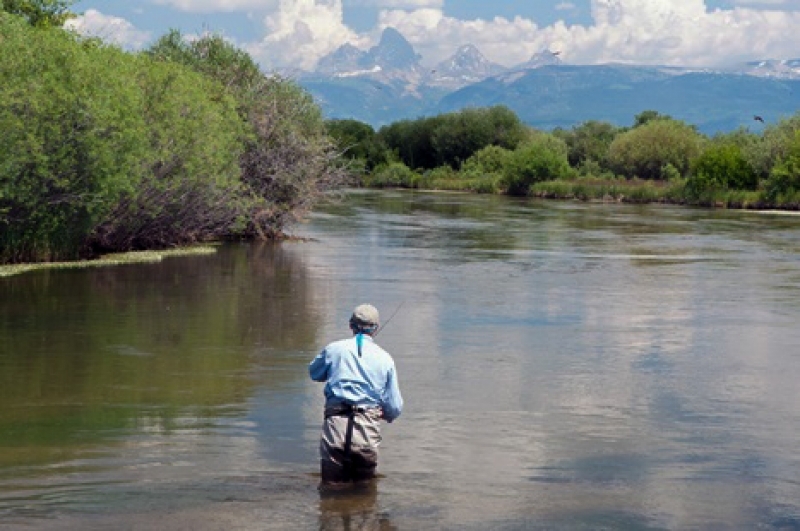 The Teton has also continued to fish well. 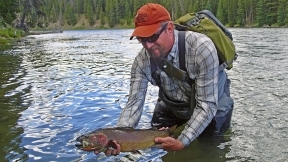 Look for large trout to be just about anywhere this time of the year. The upper end is getting a bit crowded on the weekends with tubers and paddle boards but will slow down somewhat during the week. Be patient and just let them float on by. They won’t affect your fishing too bad. I was down there on Sunday, and while I did see some folks, the fishing was good. I was swinging a #6 Tan Transformer and hooked a few good fish. There were also PMDs and caddis well into the evening and lots of fish up eating. The Park has been fishing very well. I was in the park a week ago today with my two sons and we had a great day on the Madison. I watched my youngest son Grayson who is 10 take my fly rod and walk out into the Madison River make a few cast all on his own and hook a trout! I gotta tell you all that I was beyond proud! We fished soft hackles in the morning for a while and did very well. As we headed north towards the Yellowstone River we saw Salmon Flies and Goldens. We also got to watch two good bull Elk cross the river. Unfortunately the river was closed last week so we just had to sit and watch big Cutties eat Salmon flies and Goldens but I will be there on the 15th when the river opens and I can’t wait! I would have Henry’s Fork Golden Stones in #8 and #10s I would also have Henry’s Fork Salmon Flies in #8 and #6. For The Madison in the Park I would suggest #16 soft hackles and I would also have PMD No Hackles and once again Caddis. Not much new to report on the Madison from the slide on down. 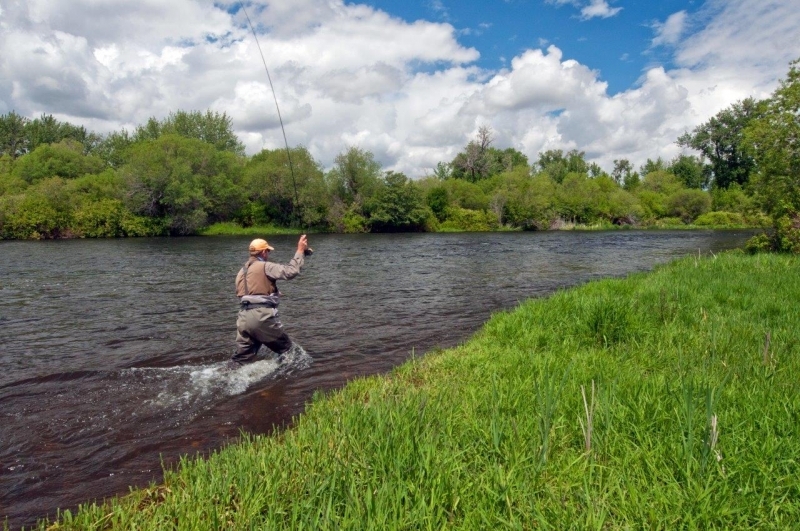 Fishing remains consistent with good hatches of both PMDs and Caddis. I would stick to fishing a #16 tan EZ Caddis in the morning until the PMD hatch starts later in the morning. Fish close to the bank with emerging caddis patterns and you should have some great success! The Fishing is about the same as my last report on both Henry’s Lake and Island Park reservoir. I would suggest hitting Island Park both early and late and try to find the gulpers eating midges as they emerge. If the lake is glassy look for pods of cruising fish to be on the surface. Throw a # 16 Chronomid in the middle of that and slow strip back for some violent eats! Hebgen is starting to fish very well with Callibeatis in the morning before the breeze comes up. A #16 Adams should do the trick. We have all the gear flies and licenses you need for the area. We also have some great deals here in the shop so come on in and say howdy.